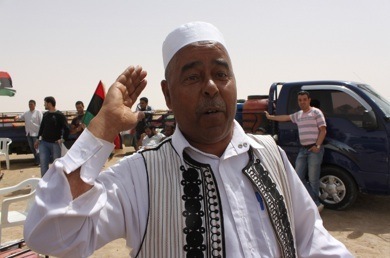 “I was born in Ajdabiya, I live in Ajdabiya, I will die in Ajdabiya”, he says, as he takes a brief respite from protecting his Libyan home town in April 2011. Change brings stories; stories describe change; and your Zahmoo story-bank helps you capture those stories, and keep them for future generations, future learning. A few hours ago, a news reporter said the TV station had an eyewitness to interview and said he understood the man wanted to remain anonymous. The man then spoke, saying he would give his name because he was no longer afraid. And he began spelling out his name, enunciating each letter deliberately. The news man became a bit impatient and cut him off before he finished, asking him what he was seeing at the moment. The man then told what was going on in his vicinity. The news man, intent on the action in the streets, seemed to miss the most important detail: A Libyan man spoke his name freely in public, to the world, before describing the reality in front of him. We’re fortunate indeed if we never have to face that kind of social strife. Yet whenever we work with narrative in our everyday world, with community, family or business – and especially so whenever there’s a big change going on – we do need to watch the context, and listen carefully for the real story behind the story: it isn’t always in the words alone. Image credit: I’m 20 Years Old by Al Jazeera English under a Creative Commons BY-SA-2.0 licence. Yes, I’ll admit it: it’s a trick, of course. But it’s a useful trick – especially for those of us who need to collect stories for organisations, communities, and even for family-history. The place is important here: it needs to be the right kind of place, the right atmosphere – the kind of ‘story-place’ where stories all but insist on telling themselves, whether we want to or not. If it’s for family-history, I’d set up in a side-area of some family gathering: a quiet corner of the kitchen, perhaps. If I’m working for an organisation, probably the best place would be somewhere in the canteen or foyer café. 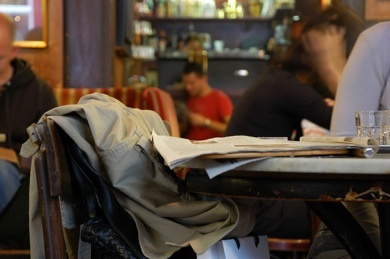 For a community project, it be might be a street café, or bar, or community-centre, or anywhere else where there’s a good flow of likely candidates for storytelling. Once I’ve found the right place, and got myself ready for story-capture, the next part is the props, casually laid out across the table. Again, these vary somewhat according to where I’m working and what kind of stories I’m aiming to capture, but the key point is that it needs to look casual, yet always inviting. For family, I’ll have an old photo-album open at some suitable point; perhaps a drawing or two; a few photocopies of someone’s handwritten diary. For a company, it might be some large diagrams spilling across the surface, perhaps with sticky-note tags suitably attached as annotations. For community, I’d use a mix somewhere between family and organisation, much as you’d probably expect, though old photographs often work best for this. I need to be seen as working, yet also easily interruptible: always ready for another story. In essence, what I’m doing is fishing for stories. The props are like the fisherman’s ground-bait: they’re the story-triggers, they tell stories in order to capture stories. The tools – my notebook, my audio-recorder, my camera, perhaps a small sketchpad too – are my fishing-net: they’re the means by which I’ll capture the stories as they come into this space, eager to show and share themselves with the stories already there on the table. Once I’ve captured the stories, I can save and share them via a Zahmoo story-bank, of course: that’s always an important part of this process. So where are some of your story-places – the places where stories gather to tell themselves? What props do you use to get the stories to flow? Let us know, perhaps, so that we can share those tips and tricks with others here? Image credit: Café Hawelcka by Cha già José under a Creative Commons BY-SA-2.0 licence. 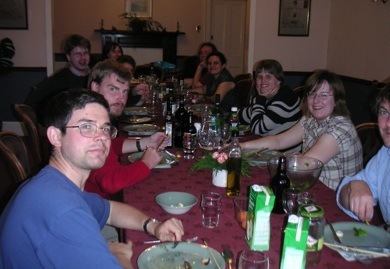 Twice this week I’ve been sent an email with a ’round the dinner-table’ photo, as a memento of where I’ve been – one from a business-meeting in Austria, the other from a family gathering in south-west England. Each of these photos describes a real story in itself. But what can I do with them, and so many other shared-story photos, to protect each story from becoming lost over time in the fog of memory and the depths of the endless email-blizzard? Open an appropriate story-collection within your Zahmoo story-bank. Click on the ‘New story’ button. This opens the ‘New story’ edit-form. In the ‘Story Type’ line, click on the ‘Images’ button. The form-layout changes to an image-edit form. Add an appropriate name, tags and source in the other fields of the form, as usual in Zahmoo. If you want to link this to a text-description – which we’d recommend you do – then you might want to define and enter linking-tags for this purpose. Click on the ‘Save story’ button to save the image as a self-contained ‘story’. This brings you back to the story-collection list, with your new story now shown at the end of the list. To create a linked text-story record, click on the link for the new image-story that you’ve just saved. This opens the details-view for the image-story. In the row of buttons to the right of the story-title, click ‘New Related Story’. This opens the usual ‘New story’ edit-form, with its default of a text-story. Add whatever details you want in the respective fields – name, text, tags and source. The name, source and tags should usually be the same or similar to those you’ve used for the photo story-record. In the text-field, describe the context of the photo, with our usual story-items: people, place, events, what happened and why, what it meant, and so on. This is also a good place to record what didn’t happen, or who wasn’t there, or anything else important that isn’t identifiable from the photo alone. Click on the ‘Save story’ button. Again, this new story will be shown at the end of the story-collection list. If you click on either of these new story-records, the link to the other story-record will be listed over on the right-hand side of the detail-page. Use your Zahmoo story-bank to capture and keep those stories safe, before they disappear into the depths of your everyday email and photo collections! Image credit: 48 around the dining table by David (Davo) Smith under a Creative Commons BY-SA-2.0 licence. As a young child, I’m told, I used to get lost quite often. I don’t think I ever did it deliberately, but we’d be in a crowd in the street somewhere, or in some crowded shop, and I’d get distracted by something and lose track of which way my parents had gone. I do remember that on one occasion, when I was perhaps five years old, that I followed after someone who was wearing the same coat as my mother, only to find out when I finally caught up that it wasn’t actually her. My parents were upset as soon as they realised I was missing again, of course, but I was never much fazed by being lost as such. Getting lost is an odd mixture of scary, frustrating and exhilarating, and it was usually the latter emotion that won out. Besides, back then, there was always a friendly-seeming police-officer nearby, and that’s where my parents usually found me, sitting in the local police-station, chatting happily to a policewoman and slurping on some questionable fizzy drink. Genuinely lost, I’d been; but it never took much more than a few minutes to get unlost again. Worrying, and unworrying, merged almost together. I still get lost, of course. I’m still too easily distracted by anything that drifts past in my travels, whether in the physical world or just the world of ideas. There are no metaphoric parents now to be lost from, or metaphoric police-officer to take me to some known place of safety, but I can find my own way back well enough. And yes, at times it can be genuinely scary for a while… but it’s still usually the exhilaration that wins out, so much so that I’ll sometimes intentionally set out to get lost in some sense, so I can learn from new experiences and new ideas in the process of getting unlost again. What are your own stories of this, in your family, your community, your business? In what ways did you or someone else become lost? In what sense of ‘being lost’ – place, ideas, behaviours, relations with others? How did that happen? And what happened next? Did the story have a happy ending, as in my own examples there? Or was there a more tragic turn to the tale? Either way, what was learned? What was lost? What was found? who were the people, the players in the story? where were the places – and were they real places, or metaphoric ones? what were the triggers that start the respective stories rolling? what were the events, the key moments that lead the story in direction rather than another? what were the outcomes – and for whom? Capture each story in your Zahmoo story-bank – and share the stories with others, so that they too can get unlost again when their time comes. 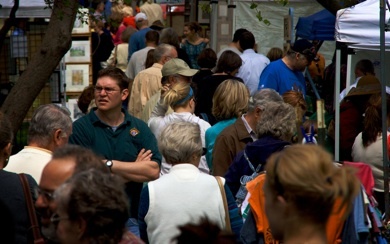 Image credit: Lost in the crowd by Travis Swicegood under a Creative Commons BY-SA-2.0 licence. 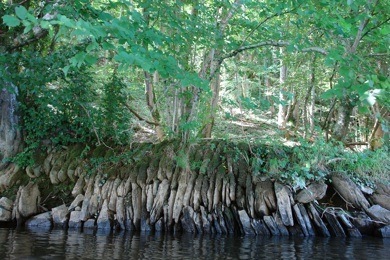 What are some of your own ‘meetings by the river-bank’? With whom was that meeting? What were your respective territories – from different families, perhaps, different businesses or communities? Different cultures, faiths, professional disciplines? What was the metaphoric river that marked the boundary between you, that perhaps kept you apart? In what ways did you connect across that gap? And what was it that each of you could see that the other couldn’t, because of that boundary, that separation, that distance? In what ways did those shared ‘insights from across the river’ help each of you in what you did next? Choose one of those events, and recapture that story from your memory – the people, the place, the start-point and events, the comfort of the known, the learnings from the unexpected. What insights and other stories arise as you reflect on this? That’s the real value of a Zahmoo story-bank, and of the discipline of managing your stories in the story-bank. So if you’re not using Zahmoo already, get started now! Image credit: river bank rock texture by mediadeo under a Creative Commons BY-SA-2.0 licence. 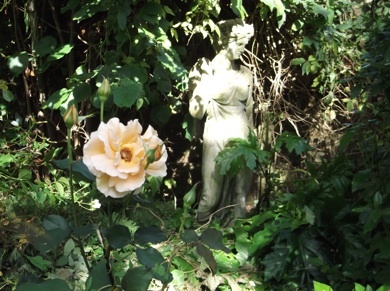 Here in my mother’s garden it’s already late summer – the last of those subtly-scented roses, the last of the summer light and warmth before the fall begins and the old statue is laid bare again. Back where I lived down south, of course, it’s just turning towards spring: a different season indeed – a different world, almost, it seems now. To each place its own seasons. And that’s just as true for families, communities, businesses – they have their seasons too. And with each season, its stories. What are some of the seasons for your family? – the cycle of birthdays, anniversaries, lives remembered, the cycle of the school-year, of religious festivals, of other themes that come and go as the months and years go by. What stories attach themselves to each of those events, those seasons? Whose stories are they? If the season is the trigger for a story, what are the events and other details of the story itself? Your community – what seasons and cycles do you have there? What are the events that mark those seasons – the annual pageant, perhaps, the farmers’-market, the flower-parade, those regular theatre-shows? How did they start, how did they become a fixture in your community’s calendar? Who were the people who started them, and who keep them going now? What memories and stories do these events bring back with them each time they return? And your business has its seasons too. Some of these seasons you might well prefer to forget: those quarterly stock-reports, the annual cycles of budgets and tax-returns, the un-joys of performance-reviews… a sigh indeed, no doubt, yet what stories arise for you there? There are those other seasons, too: the conference-season, all those different seasonal-themed sales, buying new stock for the holiday-season, the company vacation, the annual strategy-retreat – each of those will have their own stories as well. Which of these stories are personal, relating to just you yourself, or one or two people you know? Which of the stories are more foundational, that say more about who you are as a family, a community, a business? What is that stands out for you there, especially about those latter stories? What images arise – sights, sounds, scents, and sense too? What can you learn from them to pass on the future generations? A lot of possibilities for story-work there: capture and re-use those stories in your Zahmoo story-bank. It was just one of those round-the-dinner-table conversations at first. We’d started by talking about Dr Ludwig Guttman, the originator of what is now the Paralympics, and how, when he’d first arrived at Stoke Mandeville Hospital, it was considered ‘obvious’ that nothing could be done for patients with spinal-cord injury other than wait for them to die. A very different picture now! We moved on from there to other ‘obvious’ things, and how whole cultures can be organised around them. The obvious is part of the cultural air that we breathe: so obvious that we don’t notice it’s there. For example, my mother talked about how, as a young girl, it was obvious that because she hadn’t brought an evening-dress with her to her relatives’ house, she couldn’t possibly eat at the dinner-table: a maid would bring her supper up to her room instead. It was obvious that you couldn’t eat at a restaurant without a dress-suit: that’s why the separate sub-culture of the ‘grill-room’ developed, for travelling professionals and the like – and, for my mother, a wonderful escape from the ubiquitous cultural rules of the time. It was obvious that everyone should write only with their right hand – not easy for my mother, as a natural left-hander. It was obvious that the upper-class were your ‘betters’, to whom you would always give way; it was obvious that workers would be unable to do anything on their own, without a manager to tell them what to do. It was obvious, too, that no woman could ever be competent at medicine – a cultural assumption that made my mother’s professional life that much harder throughout her career as a family-doctor. Geography can also play its part in the ‘obvious’ of a culture. It’s obvious that ‘clockwise’ goes the same way as the sun – except that it doesn’t in the southern hemisphere. It’s obvious that Christmas is a winter festival – which, again, it isn’t in the southern hemisphere. It’s obvious that all Muslims must fast from sunrise to sunset throughout Ramadan – which is problematic for those Muslims who live beyond the Arctic Circle, because there is no sunset there at that time of year. It’s often a bit of a shock to discover that the ‘obvious’ isn’t – which means there’s usually also a story there, too. What are some of your own stories of this, in your family, your community, your business? Where was it that ‘the obvious’ ceased to be so obvious? When, and with whom? What happened? What were the triggers for that event? What lessons were learned from this? Capture these stories in your Zahmoo story-bank – and use it to share again with others ‘the shock of the new’. 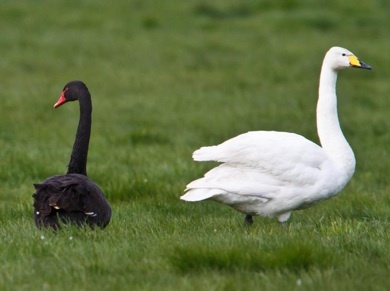 Image credit: Black Swan – Cygnus atratus – Svartsvanur — Whooper Swan – Cygnus cygnus – Álft by omarrun under a Creative Commons BY-2.0 licence. How do we make sense of story? How can we link between the layers of story to help us make sense of some broader picture, or to derive a clearer view of some desired future? One way to do this is Causal Layered Analysis [CLA] – and it fits very well with the Zahmoo story-bank. It also gives us a means to make sense with all of those small fragments of narrative that don’t match our usual story-criteria of people, place, time, triggers, events and ‘the punchline’. — At the surface is the litany, the world of the tabloid-newspaper, the everyday of ‘the world as it should be’ – or, more often, the ‘litany of complaint’ that it’s not ‘as it should be. That’s one of the classic signals here: whenever we see a key-phrase such as “they should…” or “they ought to…” or suchlike, that narrative is at the level of the litany. 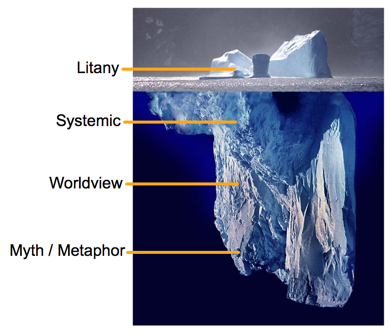 “My truth is the truth” is another theme we’ll see asserted here – and often that’s all that people will see, hence why CLA is sometimes depicted as an iceberg, with only the Litany layer visible above the surface. — Beneath this is the systemic layer, the layer of social causation. Here we’d shift from personal-story to shared-story, and to the common-themes and supposed certainties – “just the facts, ma’am…” – that underpin that shared-story. — Beneath this again is the worldview layer – the stories and narratives through which we decide what is ‘relevant fact’ and what is not. These stories last much longer than those of ‘the litany’, but they do still change over time: look at the history of science, for example, the changing stories that underpin the structure of scientific revolutions. — And beneath that is a core of deep-myth and metaphor – “the unconscious emotive dimensions of the issue”. These are the culture’s creation-myths, those deep, subtle, somewhere-in-the-background stories that underpin assertions such as “we hold these truths to be self-evident” and suchlike. It’s here that we find the foundations for different ‘ways of knowing’: for example, the very different deep-stories that underpin what we’d see in the layers above as a ‘scientific’ worldview versus a ‘religious’ one. The challenge is to conduct research that moves up and down these layers of analysis and thus is inclusive of different ways of knowing. Doing so allows for the creation of authentic alternative futures and integrated transformation. CLA begins and ends by questioning the future. With practice, we’ll see all of these layers in action as we collect narratives and anecdotes in our Zahmoo story-bank. Using its tags and comments, Zahmoo can help us identify the CLA layer where each story-fragment sits, and, using links between the stories, weave a stronger overall story of a shared-past and for a shared-future – making sense through story, with Zahmoo. Graphic adapted from iceberg-image by Uwe Kils and Wiska Bodo under Creative Commons BY-SA 3.0 license. Each time with their own story; each story with their own time; all meeting together in the same place, story upon story. Broader stories can collide with place, too. To give just one example, this is a town where the warrior-queen Boudicca (Boadicea) was no legend, but all-too-concrete fact. Or rather, lack of concrete – because by the time she’d wreaked her revenge here, nothing remained of the Roman city other than the inches-thick layer of ash that can still be found everywhere beneath the modern town. And a few paces to the right from here, the origin of another legend: Humpty Dumpty. We might know Humpty Dumpty only as a nursery-rhyme now, but it was the nickname of a squat iron cannon that the Royalist troops mounted high up in the tower of St Mary’s Church, to defend this gate, when the town was besieged during the Civil Wars of the 1640s. Evidently Humpty Dumpty did its deadly job well enough to be remembered by name, but eventually the Parliamentarians disembowelled the tower with a well-placed cannon-shot. And yes, Humpty did indeed come “tumbling down and broke his crown” – the cannon was smashed on the rubble. 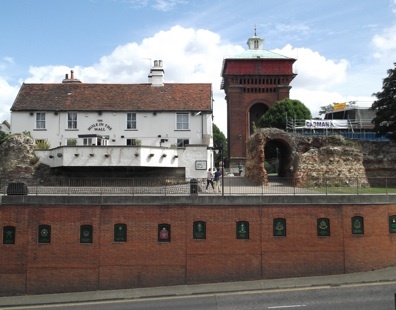 “All the Kings horses and all the King’s men” – the Royalist defenders – “couldn’t put Humpty together again”: and the town was lost soon after. Although sometimes a story is just a made-up story, often – as here – there are real events there too. Perhaps more often a story is a blend of both: and that’s especially true where different times collide within one place, causing the stories to blur together. At times we might need to be more like archaeologists, gently pulling apart the layers of story to find the subtler facts and deeper meanings hidden within. What are some of your own stories for where times collide, for your family, your community, your business? What are the places, the people, the events? What were the meanings, the lessons-learned? In what ways have those stories changed over time? In what ways do the different stories, different times, different places, different people, all collide with each other, blur together? What are the layers of story there? Stories are our means of talking with time: capture those stories in your Zahmoo story-bank. So there they are, my mother and my brother, walking down the grassy street towards the village shops. 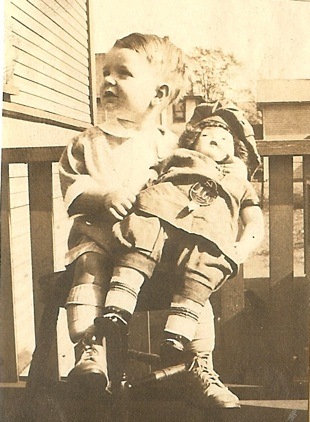 He’s perhaps three years old, at that time, proudly pushing along his beloved doll in a battered toy pram. A frumpish, overdressed middle-aged woman looks on in horror and disgust – and finally she can bear it no more. “Little boys don’t play with dolls!”, she snaps at him. My brother looks up at her, quizzically, the picture of innocence. A brief pause, as if for reflection. “This little boy does”, he says. My proper age? What’s that? Sometimes, like this morning, I feel like I’m a hundred, or more – a scrunched-up ball of aches and tiredness. At other times, as at my brother’s party, I can play silly pantomime-games as easily as any five-year-old. And in so many social contexts I’ll instantly revert to the gawky teenager, lost, shy, terribly embarrassed at everyone and everything – especially at myself. So which of these is my real ‘proper age’? I don’t know: do you? Who can tell, really? Whose expectations, then? Whose overblown ego do we have to face this time – and why? It happens at work, too – like the time we finally rebelled against the incompetent meddlings of our ex-military boss. “Insubordination!”, he yelled, with all the bombastic bluster that his petulant rage could raise, “I’ll have you frog-marched out of the establishment!” But that was one time where the contractors really did fire their manager… because everyone knew that we could get nothing done until he was gone. Others imposing their expectations on us: sometimes we have no choice but to rebel. And after the rebellion, the story. In the longer-term, the story is perhaps what matters most. What are some of your stories of expectations and rebels, in your community, your family, your business? Where and when did each of these stories take place? Who were the players? What happened, in the story? And what – if anything – did each person learn? Capture those stories in your Zahmoo story-bank – and carry their meaning onward for each new generation. Image credit: Boy by ‘playingwithbrushes’ under a Creative Commons BY-2.0 licence. Zahmoo is a story bank for collecting and sharing your family and business stories.